It’s Friday, which means that it’s time for our first Destiny 2 Xur location and inventory guide. Unlike Destiny 1 where Xur was always present in a social space, the mysterious vendor can now be found out in the exploration zones. His currency for the sequel is Legendary Shards, which can be obtained by breaking down legendary and exotic gear. Xur now stays from reset Friday morning until the weekly reset on Tuesday, so no more worrying about getting to him within a 48 hour window. This week, Xur is on Nessus. 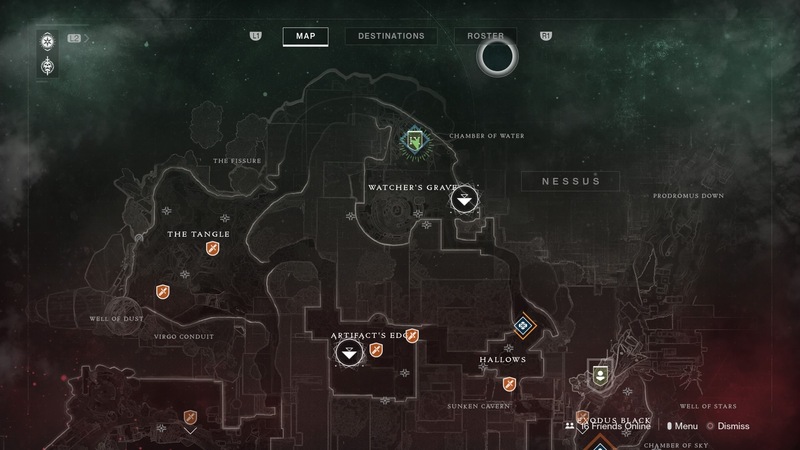 Fast travel to the Watcher’s Grave area and head right to find Xur in a tree. You can mark his location on your map. For his first outing in Destiny 2, Xur is selling the Merciless fusion rifle for 29 shards. The Raiden Flux Hunter chest armor is available for 23 shards. You can get the Doom Fang Pauldron Titan gauntlets for 23 shards. And finally, the Wings of Sacred Dawn Warlock chest armor for 23 shards. The Merciless fusion rifle is an excellent power weapon that speeds up charge time after every non-lethal hit. This perk makes it a great weapon for quick damage output on bosses, so it’s a weapon you’ll definitely want to pick up. Each of the armor pieces is one from the selection that you get during each class’ campaign, so you may already have some of them, but it’s a great opportunity to pick up the ones you missed. Raiden Flux increases the damage and duration of the Hunter’s Arc Staff with quick successive attacks, making this a must have for those that run Arcstrider and want extended time with their super. In other Destiny 2 news, Bungie recently opened up about the gauntlet hate symbol that was removed from the game, Trials of the Nine launched today, and the Leviathan Raid was completed in just under six hours from its release.